This Sausage Hash Brown Breakfast Casserole is loaded with delicious breakfast sausage, hash browns, and lots of cheese. One of the best breakfast casserole recipes for holiday breakfasts, Sunday brunch, or any other occasion. Coat a 3 quart casserole dish with cooking spray. Set aside. In a small bowl, whisk together eggs and milk (or half & half). 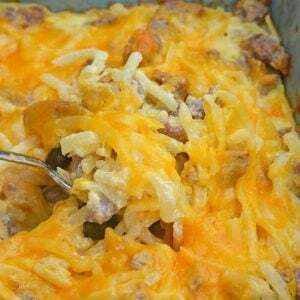 In a mixing bowl, combine crumbled sausage, hash browns, 3/4 cup cheddar cheese, sour cream, onion powder, fine sea salt, ground white pepper and egg mixture. Spread evenly into casserole dish. Top with remaining 1/4 cup shredded cheddar cheese. Bake, uncovered, for 30 minutes, or until cheese melted and lightly browned. Remove and allow to sit for 10 minutes before serving. *Using refrigerated (not frozen hash browns) cuts down on cooking time. If you want to use frozen, you will need to cook them according to package directions and then add them to the mix. I highly recommend using full fat half & half and sour cream, the lower fats don't gel as well.